Set up the stations below in a circuit around your workout area. Get your campers into teams of 3 (similar fitness levels). Give each team 2x easy/light exercise bands and 2x hard/heavy exercise bands. Go around the stations and show them how to do each exercise properly. Give them a moment to practice each movement too. Teams will pick a station to start on. 2 members of the team will do the exercise on that station while the other runs a lap around the outside of the circuit. When the runner gets back they swap with one of their team members. After each team member has run a lap, they will change to the next station, taking their exercise bands with them, and start again. Person C finishes lap and the whole team moves to the next station/exercise with Person A running first. Teams are to complete as many stations as possible in 20 minutes. Teams will have two different strength bands. An easier one for exercises that only require a little resistance and a harder one for exercises that require more. The recommended band strength is denoted in . Beginner teams might need to use light bands for all exercises. If you’re needing new exercise bands I recommend checking out HART Sport’s Versa Band. It’s more adjustable and more comfortable then tubing bands. It does provide less resistance though so be aware of that when you’re picking what strength to get. Remember that Bootcamp Ideas readers can get 15% off on all HART Sport equipment for the month of August. 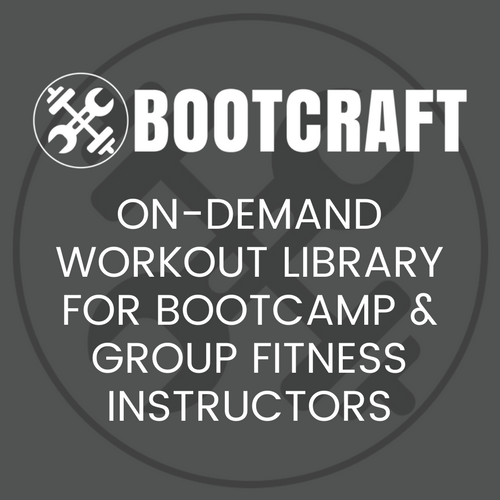 Just use the special Bootcamp Ideas coupon code BOOTCAMP15 when you checkout on the HART Sport website.